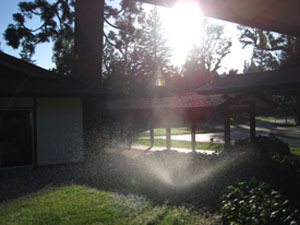 I woke up this morning to a beautiful scene here at the Villambrosa Center in Menlo Park, CA (see above picture). It makes me want to move to the San Francisco area! I’m writing this late in the evening after a full day of orientation. My feeling coming away from it is that this is an amazing program run by superb people. Katherine and Jan from the NCUSCR have organized things beautifully and professionally. Prof. Steve Belsky, our scholar-chaperone, already is proving to be a marvelous resource and great leader for our group. I feel very lucky to be a part of this. I’m also tremendously impressed with my fellow Fulbrighters. They have a tremendous variety of professional and personal experience and will prove to be excellent travel companions, I’m sure. So, we’re off to a good start! I hope tomorrow will allow for a little more reflective writing but I wanted to share a bit of what happened today.